JCMaziu Design and Illustration. : Seed of Life. Lilith from Neon Genesis Evangelion. Lately I'm taking a look at some animes that I had on my list. I have been very impressed with Neon Genesis Evangelion and what it proposes. It may seem the typical anime whose main plot focuses on the struggle of humans mechas against a supposed angels to avoid a new cataclysm, but really the weight of history falls on how the protagonists deal with their feelings and emotions and how they relate to each other while they try to find the truth after their struggle. 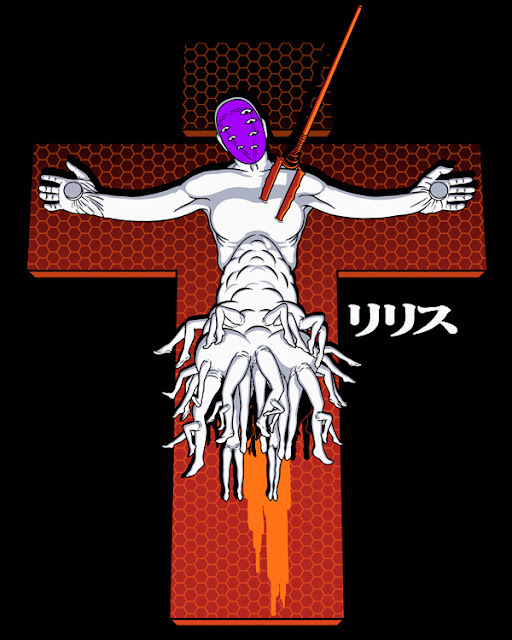 One of the characters that catches my attention is Lilith and the strong symbolism when is presented crucified and wounded by the spear of Longinus. This design is available as tshirt, wallart and other awesome stuff on Teepublic and Redbubble. Chaos. A poster tribute for Akira. The trap. A pacman parody.